After a few days getting back to nature we were plunged in to a week of travel and a new level of hecticness reserved for the inner-circle of hell, hence the radio silence over the last seven days. Very pleased to be returning not only with new discoveries from Melbourne, but also to a few welcome deliveries of tapes and wax. Had to get my hands on this record after Paul dropped a track on our NTS show a few weeks back. 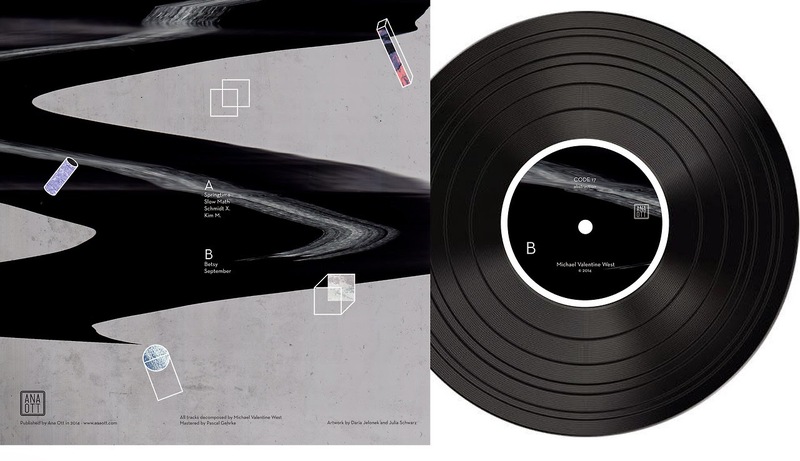 It's been some sort of perverse waiting game having not even listened to the previews of the remaining six tracks from the seven on the Code 17 Abstraction plate. Released on Ana Ott, this is the first time we've come across Michael Valentine West, though it turns out he's got a slew of aliases and has been working behind a load of joints for time. Next steps will be hunting down the rest, because this guy's on to something, and we're possibly just scraping the surface on what he's done. Every time we open the email we read press releases with fifteen or so genres and influences crammed in, discussing the melting pot of sounds stating it as 'breakthrough'. In reality, the best case scenario is generally a decent record in a genre we like. And while Ana Ott makes no such promised of Michael Valentine West, it would be oddly at home doing so. Code 17 Abstraction changes direction as often as it strips down it's tracks and rebuilds them. This in-depth soundcrafting using templates from jazz and glitch to put you on an abstract journey with each cut. Across these templates experimental analogue electronics and field workings might drop in and out to set the scene and vibe of joyous franticness and new directions. Head to the Ana Ott bandcamp to order yourself a copy.